Water costing as little as ten cents a gallon. Get more from the best performing carbon water filter with 3-Stage Under Counter Drinking Water Filter System. This system features the superior water filtration of 2-Stage System plus increased capacity to 600 gal. and an additional pre-filter to catch sediment and reduce clogging for high sediment areas. The AQ-5300 selectively filters more contaminants out like lead, chlorine, chloramines and cysts, while preserving beneficial minerals like calcium, potassium and magnesium. 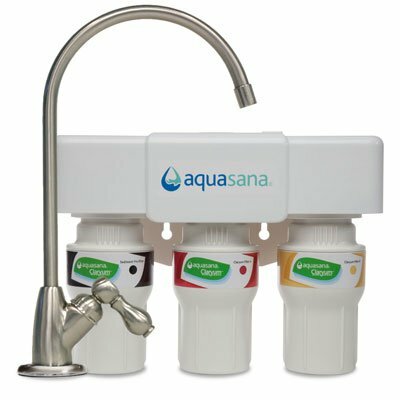 Aquasana gives you exceptional value, with water costing as little as ten cents a gallon. When you replace your filters every six months. Each time you replace the filters, you can give yourself credit for not using 4,000 16-oz. plastic bottles. Only 3 Stage Filtration Processes. Does not remove remove flouride. The water taste a bit chemical.